Milkweed grows all over the farm, and we let it. When we start to see caterpillars on them we make an effort to keep the livestock away, so that the conversion to butterfly can occur. 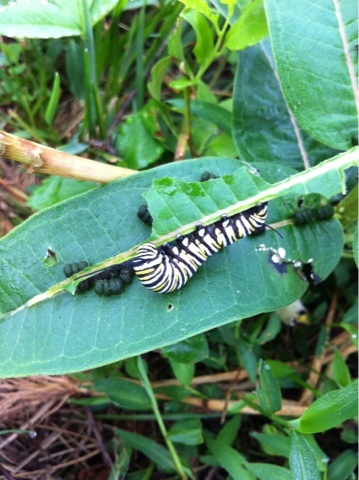 The Monarch butterfly, in it's egg/ caterpillar stage, must have milkweed. While the butterfly can feed from many different plants the caterpillar can only grow out on milkweed. The theory is that no one Monarch makes the entire flight from here to Mexico. That there are spots along the way where the butterflies stop, rest, reproduce and pass away, and the next butterfly goes a bit further, or maybe a lot further. It shocks me to think this beautiful butterfly can make a flight like that, and the drive to get to Mexico for winter is that strong, that well programmed into their system...and that the butterflies return here every year. We have the pleasure of seeing them every year, of watching them soar around the farm, of knowing that with our messy farm habits we support their lives. To walk the farm and see one of these caterpillars is such a joy! This one will shortly head into making the beautiful green chrysalis (and will be in there for about 2 weeks) before emerging as a big, beautiful orange and black butterfly. There are also theories that the ones who fly are a bit different colr, an even richer orange than usual. It must be time for this one to head south when it emerges in September, and we sure hope there is some other spot in Missouri or somewhere west and south of here where a Monarch can land, find some tasty milkweed and reproduce, sending the next generation back here next summer! Every spring we are happy to see them and every late summer we wish them safe travels. And roll out the swamp weed welcome mat so they will return!